Isabel, a Chapel Hill resident, is the daughter of two public servants. Her mother was a public school teacher in New York City, and her father was a union organizer. Her professional career has had many dimensions to it – both in the private sector (trade book publishing in New York City) and the public sector (as a social worker at the Chapel Hill Police Department and the founder of a nonprofit focused on adolescent mental health). Currently, she works at Book Harvest in Durham, an organization that is devoted to addressing inter-generational poverty by ensuring that access to literacy resources and supports are available to every child. While Isabel considers herself a bit of an agitator and activist, she generally defines herself as a wife and mother above all things. Especially germane to her involvement with FLIP NC, her son Will Guzzardi is a state representative in Illinois from the 39th District in Chicago. “My son is fighting the good fight in a state that, while traditionally Democratic, still bears the trappings of entrenched power struggles and budget challenges,” Isabel says. “Will is teaching me so much about how to advocate for legislation that protects workers and wages, education, and the economy. It’s a tough world our legislators live in.” Here, a Q&A with Isabel. What's surprised you most about canvassing? I love canvassing! I love to meet people I don’t know and strike up conversations with them. I like to find things we have in common and share stories. I am fueled by interactions with human beings, moments of looking eye to eye and acknowledging – sometimes explicitly, sometimes tacitly – that we are in this world together and we all want what is best for those we know and love. Do you like to recruit a friend or relative to sign up to canvass with you, or do you prefer to be paired with a stranger to add to the fun? If you've participated in other canvasses, how are FLIP NC canvasses different? What I especially love about FLIC NC canvasses is that I really trust the data and instructions they provide. 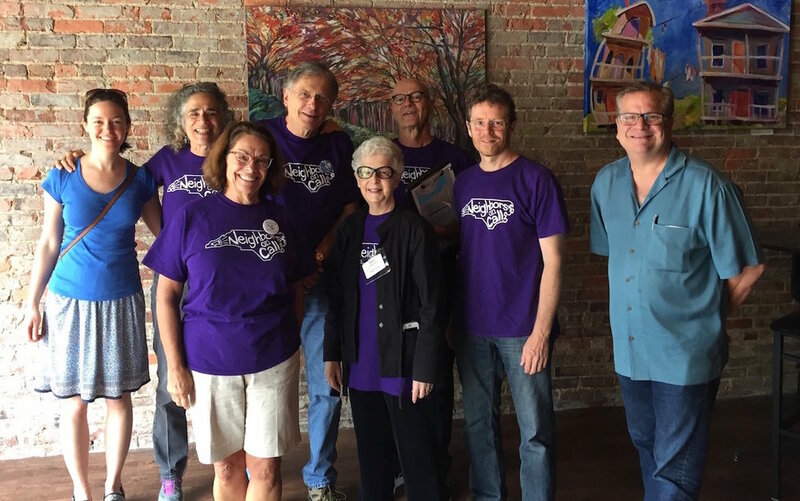 I know when I’m with FLIP that who I’m canvassing, where I’m going, and why I’m participating is razor-sharp-focused on making a difference this November for the NCGA. How many times have you canvassed with FLIP NC? Hmmm … at least half a dozen times. How did you find out about FLIP NC? Initially through Neighbors on Call, where I am a chapter co-lead. I love that FLIP NC has solid data to back up its agenda. Amy and Briana are amazingly well informed and organized. And they imbue their gatherings with a spirit of camaraderie that keeps me wanting to come back! Isabel (second from left in the back row), with her fellow Neighbors on Call. Have a funny story or touching moment to share? I have so many stories from canvassing – and, of course, that’s what’s so incredibly nourishing about the experience. Every time I go out, I meet at least several people who I really connect with in unexpected ways. A couple of weeks ago, I was knocking on doors in Wake County and got into a conversation with a fellow who had an accent that was clearly not from North Carolina. It turns out the guy grew up in Jamaica Queens in New York – just like me! – and he went to my high school (though I graduated years before him!). There we were in his front yard, singing the alma mater from Jamaica High School! Just today, I went out canvassing and approached a lovely home with floor-to-ceiling glass windows on either side of the front door. The curtains were drawn on the windows, and when I rang the doorbell, the woman who lived there pulled aside a curtain to peek at who was calling on her. She was an elderly woman, and I took the cue from her to introduce myself from outside the glass. She seemed skeptical at first, but when she came to understand that I was there to be sure she knew the strong progressives that are on the ballot in her district and that my interest was in securing her pledge to vote in the mid-terms, her face lit up. Still behind the glass between us, she said, “Oh, yes, I will certainly be out to vote, but listen here: You should be talking to everyone about the judicial races and being sure you let everyone know who to vote for. These non-partisan races are ridiculous, and they’re just trying to get us confused!” Well, let me tell you that the wisdom from this woman trumped all the wisdom I’d heard all day (pun intended!). What's your top canvassing tip? Connecting with another person in an authentic and very simple way is an incredibly gratifying and powerful experience. Can you change someone’s mind in one exchange? Can you convince someone to vote in one encounter? It’s possible, but highly unlikely. But what you can do is leave behind a positive feeling in another person and experience that yourself. For my two cents: This is how each one of us can do our part to change the world. What is really motivating you to get involved? Obviously, you want to FLIP NC, but tell us a bit about the "why." After the 2016 election, I felt like I needed to do something that would make a difference. To be honest, re-engaging on the national political scene felt too overwhelming – disheartening and, frankly, even a little hopeless. But right here in my home state, I felt that as a working foot soldier I could channel my energy into really productive outcomes. I’m the kind of person that needs to be involved in my community, to do what I can to help others, and to ensure a safe and equitable present and future. I have been inspired by young and visionary leaders who want to re-imagine the democratic process so that it works better. I’m up for that, and for doing what I can to support these hopeful efforts. How are you feeling about the 2018 election? Optimistic? I was feeling very positive about 2018 until most recently, when I began to feel that the public narrative and discourse are espousing too optimistic a prediction for the outcome for the election. I/we have been burned by that before (thinking about 2016, of course), and I started getting nervous that complacency may be setting in. Now more than ever, I feel so strongly that we have to stay vigilant and on-course, energetic, and engaged. We need every single voter to get out in November; we can’t take one vote for granted. We have to resist canvasser-fatigue! As for me, I’ve committed to go out and talk to my neighbors at least four times a month until the fall. And then: I’ll be beating the pavement as often as needed!